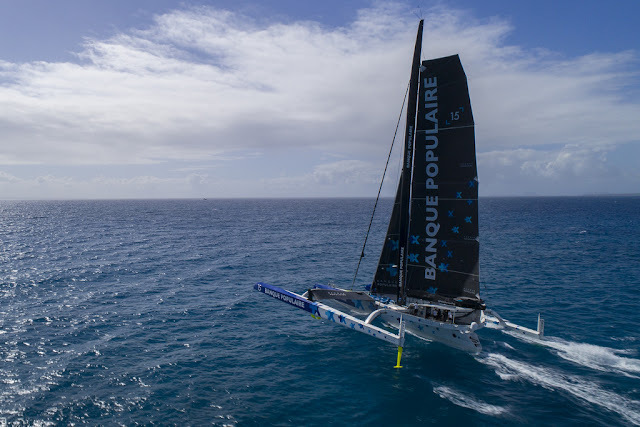 Photo credits: Yvan Zedda / BPCE - Théo Reynal / BPCE - Just back from a great racing F18, to read a mail from James Baeckler on the BP IX Trimaran capsize .
" That night we sailed on port tack towards Cadiz. We left Tuesday from Lorient, we had made a big edge along Portugal. To train, we went to find a crossing point in the northwest of the Canaries. We were returning to Cadiz to pick up the crew for the rest of the program. Armel Le Cléac'h : The sea was a little formed because the wind had been sustained for quite some time on the west of Portugal. Down to the Canaries, we had strong winds up to 40-45 knots. We were on a fairly tight edge, unbridled close, a reef in the mainsail and the little jib. I had done the routing and over the hours the wind had to go down. The conditions were pretty stable, I checked and there was no grain or thunderstorm in front of us. Pierre-Emmanuel Hérissé (the technical director of Team Banque Populaire) and our media-man were inside, I was in my hut on standby maneuvers. I was lying down for five minutes on the bunk to start a nap. The boat started to get up very quickly due to an over casted wind, I did not have time to go out. I could shock the mainsail but it was not enough. Everything went very fast, the boat sailed to the starboard side. I found myself upside down in the water that flooded the cabin. Pierre-Emmanuel called me to find out if I was there. We managed to hear between two waves, I managed to get out of there and hoist myself in the central hull safely with them, in the shelter. We immediately made a point to make sure no one was hurt. I quickly triggered the distress beacon to alert the authorities. We put security equipment together and put on our survival suits. I contacted Ronan Lucas (the director of Team Banque Populaire) with the portable iridium that was in the survival can to tell him that we were all aboard and especially that there was no injury. Two hours later, a freighter arrived on the area, we exchanged with them by VHF. It was dark, we could not get out of the boat immediately. The day came up, a patroller had to join us at the end of the day but finally a helicopter of the National Navy was able to take off from Casablanca this afternoon to pick us up. Upon arrival, one after the other, we boarded the helicopter and landed at Casablanca's military port on a docked frigate. We were very well received by the Royal Moroccan Navy, we could eat and do some health checks, we thank them for everything and the crew of the helicopter. We were later taken in charge by the Consulate of France. " It is really hard to endure, the conditions at sea were manageable, we have already sailed before in much stronger and committed conditions. Everything rocked in seconds. In my opinion, it is linked to an oversold wind. By the time we left the boat, the three hulls and the arms were intact, the mast as for it, is broken into several pieces. " A race against time is now engaged to recover the boat as soon as possible and make every effort to be at the start of the Route du Rhum next November.